Amazon Price: $1,818.00 $1,548.41 You save: $269.59 (15%). (as of April 22, 2019 10:59 am – Details). Product prices and availability are accurate as of the date/time indicated and are subject to change. Any price and availability information displayed on the Amazon site at the time of purchase will apply to the purchase of this product. 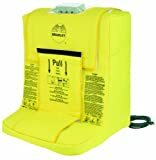 On-site gravity fed portable eyewash W 121 watt heater jacket, Holds 7 gallons of potable water, Lower lank houses push down eyewash tray, SEI certified to ANSI Z358.1-2009. Full, one-year warranty, water preservative not included.